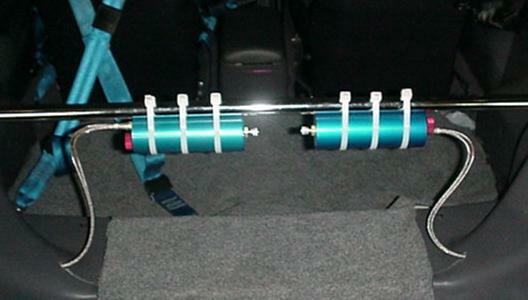 Here's the reservoirs for the rear shocks, mounted in the car. They're attached to the upper strut tower brace with some zip ties. The red knob is the compression (bump) adjustment; the rebound adjustment is in the top of the shock rod. 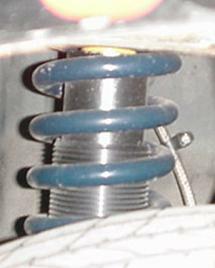 This is the rear shock and spring, as seen through the rear wheel well. The line (and a retaining clip) are visible to the right. 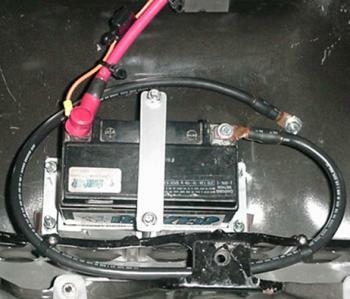 Here's the battery in its new home in the back of the car. The smaller wire is for the fuel pump rewire. It's a Baker Precision sealed gel cell, it weighs 12lbs, and it has 30 more CCA than the stock battery. The mount is another product of our home shop. 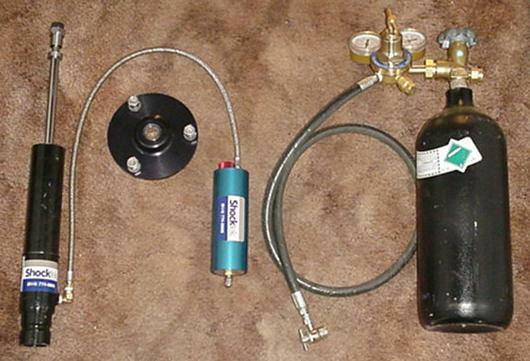 Update 2010: When we got these shocks, we were convinced we were all that and a bag of chips too, because these were the most advanced shocks in our class, and probably in the whole sport.